LGSEC does not have any upcoming forums – please check back for updates. You are invited to join the Local Government Sustainable Energy Coalition (LGSEC) for a one-day information and networking forum for California local government energy and climate professionals on Thursday, October 25th from 8:30 AM – 5:00 PM at the Santa Rosa Veteran’s Memorial Center followed by a energy and resilience-focused tour on Friday October 26th! With an emphasis on local government stakeholders, the forum will explore current planning and communications at the utility and local government interface; discussion among California’s local leaders who will share experiences and lessons learned before, during, and after disasters, including the firestorms of 2017; and what needs to be done now to include energy resilience in preparing for future disaster response and recovery. October’s meeting will focus on the issues raised by recent decisions by the Investor Owned Utilities (IOUs) to de-energize electrical distribution lines during times of high fire risk, as well as the ongoing emergency preparedness and disaster recovery proceeding at the CPUC. Energy systems are vulnerable to extreme events; earthquakes, wildfires, winter storms and rising sea levels can all damage critical energy infrastructure. When electricity infrastructure is damaged in the wake of natural disasters, or when electrical service is interrupted unexpectedly, it can have wide-ranging impacts. Essential response and recovery services can be seriously impaired. Wildfires, storms and earthquakes may be out of human control, but preparing for them and their aftermath, is not. Through discussion, hands-on exercises and peer networking, forum participants will come away with an understanding of current regulatory and legislative actions, information, tools, and resources and an actionable road map to improve energy resilience in their community. Santa Rosa Junior College Microgrid Tour – FREE! Extend your trip and stick around for the Disasters and Energy Resilience Microgrid Tour on Friday, October 26th at 9:00 – 11:00 AM. The tour will take place at Santa Rosa Junior College who has a Vision for being a leader in Sustainability and creating a “Strong Culture of Sustainability” both for it college campuses and the community at large. The tour will begin with a review of the process taken by a public agency to analyze at a high level what it takes to have a microgrid, discuss how senior-level managers were included in the design process and the eventual approval by the District’s governing board to develop a microgrid. This will be followed by a review of the current microgrid design, completed infrastructure to date and future infrastructure integration. A tour will take place that will show currently completed infrastructure as well as old infrastructure that will be retrofitted to integrated into the future microgrid. The Local Government Sustainable Energy Coalition (LGSEC) and the Sacramento Municipal Utility District (SMUD) invite you to register for a one-day informational and networking forum for California local government energy professionals on Monday, April 23rd from 8:15 AM – 5:00 PM. The event will take place at SMUD’s Customer Service Center building at 6301 S Street, Sacramento, CA in the Rubicon Room, on the first floor. April’s meeting will focus on Energy Storage: Meeting California’s Clean and Reliable Energy Goals. Speakers will provide valuable insights on California’s Energy Storage roadmap, the state of the technology, emerging policy, decision-making tools for implementation and first-hand project experience. Rick Brown | President, Terraverde Energy, LLC. January’s meeting will focus on microgrids, including a report on the State’s microgrid roadmap, the state of the technology, project examples, tools, and resources. Microgrids are considered essential for the future of distributed and clean energy generation, reliable and resilient energy systems. Please join the Local Government Sustainable Energy Coalition (LGSEC), New Buildings Institute (NBI), and The Energy Network for a quarterly energy networking meeting and Zero Net Energy workshop for California local government energy professionals on Friday, December 9th in Santa Monica from 8:30AM – 3:30PM. The Local Government Sustainable Energy Coalition (LGSEC) in partnership with LEAN Energy US organized a day-long Community Choice Energy Forum for local government decision-makers, staff members and key stakeholders on May 18th in downtown Los Angeles. 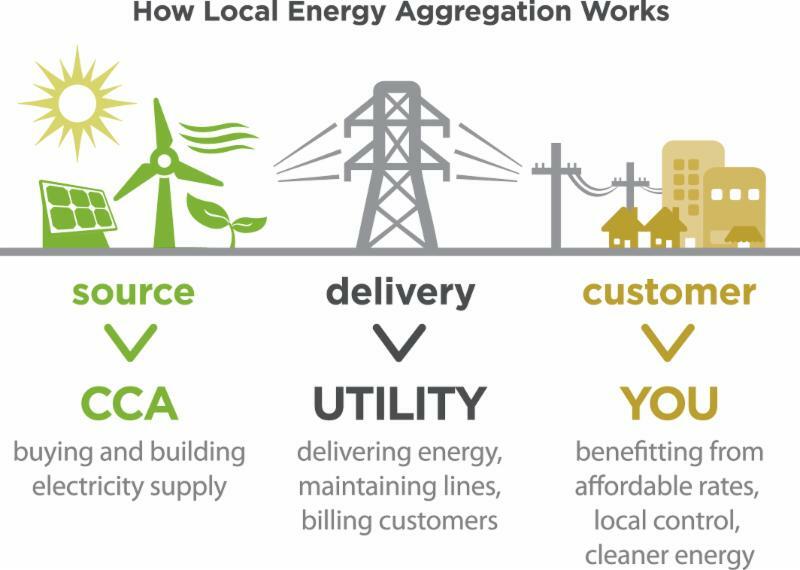 Over the last five years, Community Choice Aggregation (CCA) has become an increasingly popular option among local governments interested in providing greater customer choice, cleaner power and competitive energy pricing. Communities throughout the state have founded or joined existing CCA programs and numerous other communities are in the process of conducting research and feasibility studies.